Over winter break, I made a brief foray into the World of Practical Sewing, and sewed an actual, functional, waterproof garment. Not for me, of course, I have far more waterproof garments than I ever wear in my indoors-y lifestyle. My dad bought several parkas a couple of years ago, made of canvas. I think they were Swedish army surplus or something, effective windbreakers but not terribly useful in the rainy Pacific Northwest. 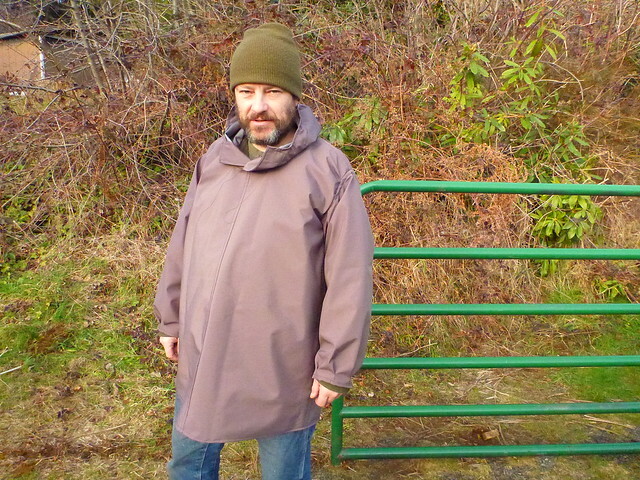 He took one of them apart to make a pattern, and bought a great deal of Goretex. I sewed it up, with some alterations of course, and finished it mere minutes before I returned to school. The Goretex didn’t iron very well, even on low heat with a towel, and all the seams were flat-felled, which would have been a lot easier if I’d been able to press it without melting it. I had to use a 100 needle and change it regularly, especially when I got to the point where seams began to intersect and the fabric dulled the needle really fast. I pretended that I was sewing out of dragon skin, in order to make the fabric’s idiosyncracies less frustrating. It worked pretty well to imagine myself as an apprentice dragon-skin-tailor, who had finally earned enough skill to try making something out of real dragon skin (I spent most of my formative years reading fantasy novels, if you couldn’t guess). Because I was flat-felling my seams and working with such an unusual fabric, I could look past my slightly wobbly seams and see the beginnings of a ready-to-wear garment–except not ready-to-wear, made by me! It was really exciting to be making something so practical and ordinary-looking (weird…). This sort of excitement really only lasted up until I had to put the underarm gussets in. I’d never done gussets, and in a stiff fabric with flat-felled seams–well, it wasn’t too pretty. Everything really started to disintegrate around there. Gone were my clean, straight (ish) seams and smooth surfaces, now all was wrinkling and puckering and weird gathers. I managed to set in the sleeves, though I had to re-do one of them and probably should have re-done them both, if it wasn’t for the holes that the needle made in the fabric. I knew they would leak forever, and in a parka specifically made to keep water out, I decided that a wrinkly sleeve was better than one that let the rain in. Because of the nature of the pattern, there were no instructions whatsoever, so I sort of had to make up the order of construction and how the pieces fit together. That was most troublesome with the hood, which had be far the most pieces, but it the end it looked better than the sleeves. Goretex is a pain to work with. Flat-felled seams are now a piece of cake. 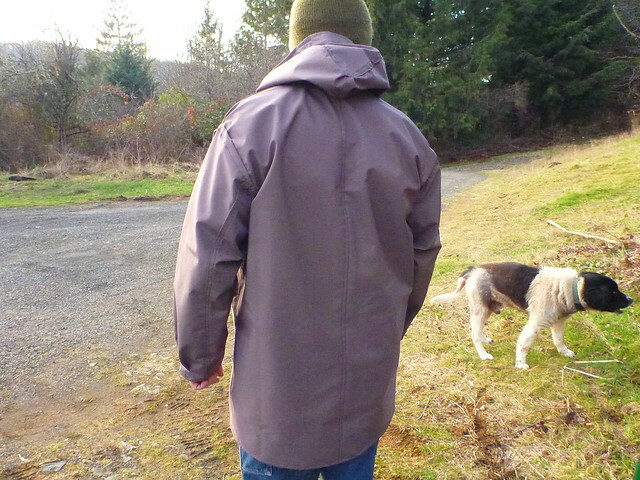 This entry was posted in sewing and tagged for mark, menswear, outdoors, sewn on February 2, 2013 by Alice.